Optimum Release Characteristics are Required by the Adhesive Backing Release Liners | Fabrico, A Division of EIS, Inc.
Release Liners used by Fabrico Medical include easy- or medium-release and one- or two-side release. They are made from films and papers of various thicknesses and degrees of rigidity. Fabrico Medical uses DAHLAR® 9200 release film for rigid, rigid-flex, and flexible circuit applications. 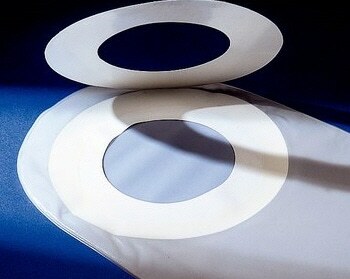 Fabrico Medical offers release liners that are compatible with a variety of adhesive systems. Our design and engineering team provides liner materials for optimum release characteristics required by the adhesive backing for slit and custom die-cut medical materials. Non-adhesive parts require low-tack adhesive liners that are compatible with the intended speed and accuracy requirements of the manufacturing process. Fabrico Medical is an experienced converter of Polyester (PET) Loparex Primeliner™ silicone coated films, available with either one- or two-sided release options. Primeliner is a trademark of Loparex. PET Primeliner features include: Well-suited for wound care, electrodes and electro-medical devices, and ostomy devices. Contact Us for help with your application challenge.